So I’m home safe and sound after a wonderful trip to the Pacific Northwest, and in an attempt to combat my jet lag with mindless tasks, I found myself cleaning out the drafts folder on one of my older email accounts a couple of days ago. That was where I ran across the following story, which I apparently wrote and then promptly forgot about, oh, eight years ago. It describes an experience Manuel and I had while traveling in Greece in September 1999, and while at first I didn’t think it had much relevance to a food blog, lurking at the very end was a passing reference to one of my all-time favorite Greek dishes – salty, crusty cheese saganaki. Of course I had to run off and make some as soon as I had finished reading; if the mere mention of fried cheese gets your stomach growling as much as it does mine, I would suggest you do the same. When we stepped out into the street that morning, a chilly breeze was blowing the scent of salt in from the sea. It was so early that the harbor lay silent and empty as we trudged past, the fishermen still at work and the tourists still asleep, the dockside restaurants dozing between the last of the nighttime revelers and the first of the morning patrons. Rubbing our arms against the chill, we checked our watches and hurried up to the bus station against the slow lightening of a perfectly clear sky. We were well toward the end of a month-long stay in the Greek Islands, and the time had come to do what every tourist brochure insisted we must: hike the famous Samaria Gorge on the island of Crete. The hike had in fact been recommended to us well before we ever browsed a tourist brochure – a friend of my mother’s had waxed so nostalgic about hiking the gorge in her youth that we were afraid she would invite herself to come along. But even without the personal recommendation we would have found it hard to resist undertaking one of the most celebrated of Greek tourist activities. It seemed that every tourist agency south of Athens heralded the same large posters of scantily-clad hikers lounging casually beneath spectacularly towering cliffs. Luckily three weeks of feasting on moussaka and retsina hadn’t overly dampened our athletic vigor, and the prospect of a relaxing, mildly challenging stroll through beautiful countryside seemed the perfect antidote to our holiday hedonism. The Samaria Gorge is famous both for its history and its dramatic landscapes. It has the distinction of being Europe’s largest gorge and is Crete’s only national park. Its enormous striated cliffs, we had read, were formed over the course of fourteen million years not by snowmelt, but by rainwater which only flows a few months out of the year. It is home a wide variety of microclimates unique to the Greek Islands that range from lush forests to parched semi-desert, and if we were lucky, we might see some of the rare fauna that has sought refuge in the gorge from the habitat destruction and rampant overdevelopment on other parts of Crete. We were not too surprised to find the bus station packed to the hilt with prospective hikers. As our guidebook had said, the only way to complete the hike and arrive in enough time to catch the bus back to Hania was to leave as early as possible, and not wanting to pressure our hike we opted for the first bus leaving at six-fifteen. From the looks of it, everyone had the same idea. If we had learned anything about Greece in September it was to dress for the heat. Today we had donned our usual shorts and t-shirts, but on the advice of our guidebook that the hike was ‘rougher than you expect’, we bagged our sandals at the last minute and strapped on hiking boots. Though maybe we overreacted, I worried, as I caught sight of others in sarongs and rubber flip-flops. Probably our sandals would have been fine. Two hours later the bus spilled us out at the top of the gorge along with the contents of several dozen other buses, most of them chartered by tour groups. People were still wrapped up in sweaters, but already it was apparent the day was going to be a scorcher. As we dug out our sunglasses and strapped on our packs, my eye was drawn to a well-muscled, middle-aged hiker in animated conversation with a group near the trail head. It took me a second of feeling very unfit by comparison before I realized he was a park ranger, and his bulging leg muscles no doubt attested to his daily familiarity with this trail. From the parking lot, the trail began with a steep series of switchbacks through a cool pine forest down to the riverbed. Although we were mired in a continuous parade of people, we were convinced that as soon as everyone settled into their pace things would clear up a bit. We even stopped for a drink when we reached the river, thinking that if we let the initial rush of people pass, we would have the trail for ourselves. We glanced back up at the three thousand knee-jarring feet we had just descended. "I guess they don’t give you much option of turning back!" Manuel remarked wearily. Although we waited for more than twenty minutes, the people didn’t thin out. In fact, they seemed to be increasing in density. So we packed up our water bottles and rejoined the parade. The trail was beautiful, passing from lush forests into barren moonlike plains, but all the time keeping its bearing along the trickling waters of the river. The river is generally dry for most of the summer, but can increase to a raging torrent in winter, during which time the gorge is closed to hikers. I had briefly skimmed an account in our guidebook of a flash-flood that swept several hikers out to sea a few years before. "Do you think we should check the weather forecast for tomorrow?" I had asked Manuel the night before. "Are you joking?" he scoffed, "have you seen a cloud in the sky during the last three weeks?" I hadn’t, actually. So we plodded on under the intense morning sun, chatting a bit with fellow hikers and looking forward to our lunch. Every so often a fast hiker or two would pass us on the trail, but at a certain point I realized that one particular person kept passing us in both directions. It was the park ranger we’d seen at the top. His lean legs moving like pistons, he was constantly racing back and forth along the trail, presumably on the lookout for injured hikers. Every time he passed us he would grin and wave and shout a few words of encouragement. At some point I became aware that the sun was no longer fiercely burning the top of my head. I took off my sunglasses and glanced up at the sky. "Is it my imagination or is the sky gray?" I asked Manuel. He too glanced up. "Hmmm… I think it’s just hazy," he said so confidently I almost believed him. It didn’t really look like haze to me, but since it didn’t look threatening either, I decided not to worry. We were coming to our designated rest spot soon, and there was the more pressing matter of lunch. Our rest spot, the remains of an abandoned village tucked away in a bend in the river, was swarming with picnickers. We found a spot on a crumbling stone wall and eased ourselves down, and I pulled out the guidebook to read more about flash floods. And then, without warning, as Manuel handed me my sandwich, it began to rain. eir conversations and their lunches. I, however, hurriedly scanned the paragraph in the guidebook, which began "Flash floods are a real possibility in the Samaria Gorge, both early and late in the season, and are not to be taken lightly. In 1993 several hikers were killed when a flash flood swept down the gorge and carried them out to sea. Prospective hikers are advised to contact the gorge information hotline for current weather information." We really should have called, I chided myself, but surely if there was trouble in the forecast they would have closed the gorge, wouldn’t they? I calmed myself with the thought that it was most likely just a passing shower. Just as my heart rate returned to normal, a figure appeared at the entrance to the rest area, gesticulating wildly and whistling for attention. It was the ranger again, now clad in a yellow rain slicker. We moved closer to hear what he was saying. "You must not rest here any longer," he called out in heavily-accented English. "At the bottom of the gorge it is raining heavily. The walls are very narrow and rocks can slip down. It is very dangerous! Please finish the hike as quickly as you can. Do not stop again." He repeated his message in Greek and then to illustrate his point to the non-English speakers, he indicated the narrowness of the cliff walls at the end of the gorge, and mimed out the process of a large rock hitting him on the head. Gasps went around. A flurry of hikers gathered around him asking more questions, but we didn’t stick around long enough to hear his replies. Like lightning we repacked our untouched sandwiches and hurried back to the trail. How much longer was the hike? We had been hiking for nearly three hours, and guessed that we were near the halfway point of the 18-km (11-mile) trail. That meant we still had a long way to go. As the rain increased I kept glancing over my shoulder towards the direction from which we’d come – was it my imagination or were the clouds over the top of the gorge blacker than everything else? I shuddered in fear. "I don’t want to die in a flood." "Forget about floods," Manuel called over his shoulder, "and watch out for falling rocks. They’re a lot more likely to end your life today." How comforting. If we weren’t so scared, our situation probably would have seemed humorous. The mass of dripping people plodding through mud and water could have been actors cast in a scene of the biblical Exodus, if it weren’t for all the Gore-tex and nylon. The rain had become a steady downpour and the river was already gaining volume. People with twisted ankles huddled by the side of the trail waiting for help (mostly the flip-flop wearers, we noticed), while others leaned on friends for support as they attempted to navigate the slippery boulders and steep descents. Plank bridges that had been laid out to cross the trickling river were now submerged in swirling water. Manuel gripped my hand tightly as we stumbled along, exhausted and hungry, but too wary of the guide’s warning to stop. One thing we could feel good about was that at least we had chosen to wear hiking boots – if we hadn’t, we probably would have counted ourselves among the injured. At one point, the people behind us parted to make way for a yellow-clad figure that was overtaking everyone at a near run. His brows furrowed in concentration, he brushed past us without even a glance. It was the ranger – and that was the last time we ever saw him. After a couple of hours the gorge narrowed abruptly and the flow of people came to a bottleneck at a large wooden sign. "Danger: Falling Rocks Next 2km. Do not stop," it read. We had reached the beginning of the famous ‘Iron Gates’ – the section of the gorge in which massive rock walls rise sheer to a thousand feet, yet the canyon is so narrow that someone standing at their base can almost touch both sides at once. It was spectacular, and as though possessed not by common sense but by tourist instinct, people started to dig into their saturated bags to find their cameras. As people trickled into the Iron Gates, the chatter died out. It was like entering a cathedral, silent and watchful – even the rain had diminished. People crept along a wooden walkway that had been suspended above the swirling waters, one eye on their next step and one eye on the walls above. Every few seconds the smack of rock on rock would reverberate throughout the canyon and everyone would freeze in midstep until the sound had died away. Carefully, painfully – at this point we had been hiking without a real break for more than five hours – we made our way through this crack in the mountains, our breaths held in unison, well aware that every step forward was a step out of the reach of danger. To divert my focus from the throbbing pain in my legs, I lost myself in pondering the restaurant possibilities for celebrating our survival that night. And just like that, the canyon widened, the walls fell away, and a valley of parched sunshine opened up before us. We passed the last kilometer marker and a brusque attendant collected our entry passes from us. Some people stopped and cheered, others just continued on as if their legs would never stop moving. We had made it, walking for close to six hours straight, and basking in the warm sunshine now beating down on us we could barely believe we’d just been racing for our lives against a tempest inside. That night, the furthest we could make it to celebrate was the little taverna two doors down from our hotel. We hobbled in and ordered the biggest glasses of beer they had, and then slowly began to dissect the events of the day. We, like probably everyone everyone on that trail, had assumed that any activity undertaken by thousands of tourists must be risk-free. Ironically, though, that very assumption had probably put us in danger, as we hadn’t even taken common-sense precautions like checking the weather forecast; others had been more foolish by not even dressing appropriately. Luckily no one had been seriously hurt that day (at least as far as we knew), but what would happen next time it rained? Just then the waiter appeared to deliver our plates of cheese saganaki and grilled fish. He cleared his throat and grinned. "So," he began in a well-rehearsed pitch, "we have many beautiful things on Crete. Can I recommend a visit to the Samaria Gorge?" I’ll be honest: I don’t think I let a single meal go by in Greece without ordering saganaki. Technically a meze (and thus often part of a large spread), I always ate it on its own as an appetizer; I mean really, what better than fried cheese to get the digestive juices flowing? When I make it myself I usually use feta since that’s what I have available here; if you can find kasseri or kefalotyri, though, they’re actually much more authentic. As for the grapes, well, that’s my innovation – I think their tart sweetness perfectly compliments the rich salty cheese. Serve it as an appetizer, a party snack (in which case you can cut the cheese into smaller pices before dredging, and skewer each piece with a grape on a toothpick), or even as a light meal with some salad and bread. In a heavy-bottomed skillet, heat one tablespoon of the oil over medium-high heat. When hot, add the grapes and sauté, stirring occasionally, until completely soft, about 7-8 minutes. Remove with a slotted spoon to a bowl. Add the remaining three tablespoons of oil to the skillet and place back on the heat. Run one piece of cheese under the tap and shake off the excess water (be gentle though so as not to break the cheese). Dredge it on all sides in the cornstarch, then quickly place it in the hot pan. Let it develop a nice brown crust on the bottom side, about 2-3 minutes, then flip and fry it on the other side. Using a spatula, transfer it to a clean plate. Repeat with the other piece(s) of cheese (or do them simultaneously, if your pan is big enough). To serve, top each piece of cheese with some sautéed grapes and a lemon wedge. Serve immediately. I love dairy. I love fried things. Yay for your draft folder. I just love Saganaki. This summer I had some in Chicago at a restaurant called Greek Islands, and it was wonderful. Beautiful photo. Looks absolutely delicious! 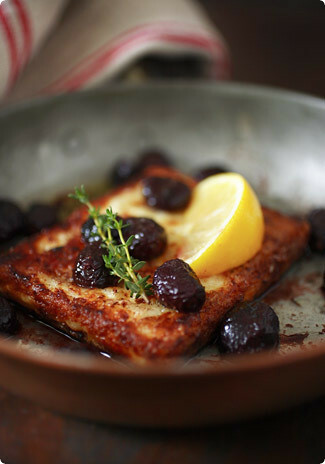 I love haloumi and saganaki, will have to try and make this! Whew. Avid hiker though I am, perhaps it’s not such a bad thing that all my time on Crete–in Hania, no less–was spent lazing on the beach. I was with non-hikers that trip–and after this story I’m fine with that.But the cheese, the cheese I will have to do something about!Aren’t old stories fun to rediscover? This one is a gem. Fried Cheese? I’m all for it! What a wonderful story- I love that detail about hiking through the mud like Exodus in Gore-tex.Can you believe I had never had saganaki (a bad experience with mozz. en carozza ruined fried cheese for me), so I actually made this last night. Our feta was a little crumbly, so the result was slightly messy, but it was delicious! Two of my friends really loved it (one was more apathetic). I’d say the saltier the cheese the better, and the grapes are a great addition. fantastic post – really interesting. i dropped by because of the saganaki – we fell in love with this on the island of Skiathos last year, and have been cooking it ever since – usually topped with some sliced peppers on top and a drizzle of balsamic vinegar – try it! i agree – Greek food is often underrated; i love it. I’ve never had saganaki before, but now I’ll have to try it. P.S. I deeply envy your food photography skills. OPA!! I love saganaki with fresh baked bread to balance the saltiness of the cheese. Brings back memories of a greek restaurant I used to go all the time. I would have appreciated a few clouds on the day we hiked the gorge. It was so hot and sticky. I can’t even imagine doing it in the rain. I spent the whole time looking at my feet as it was in the hopes of not twisting my ankle or sliding in some scree. I didn’t even make it to the taverna two doors down that night. My husband went out and found me a pizza. It was just about the most perfect thing I’ve ever eaten. I tried Saganaki cheese a few years ago in a Greek restaurant in Toronto … I loved it … now living in Portugal, I need to go on a hunt for this cheese. You’ve stirred my palate with this post. Thanks! What a wonderful blog. I just discovered you…I’ll certainly be back. I love fried cheese. Saganaki is really delicious with kasseri or kefalotyri but my personal preference is a rarer, salty cheese called "Mpatzos", which can be found mainly in Northern Greece or a few delicatessen shops is Athens. It has a kind of spongy texture and it is saltier than kefalotyri. If you put in a hot pan, it quickly becomes cranchy on the outside but inside it remains tender and spongy. Obviously, it is impossible to be found abroad, but next time you'll be in Greece, I strongly recomend to give it a chance.